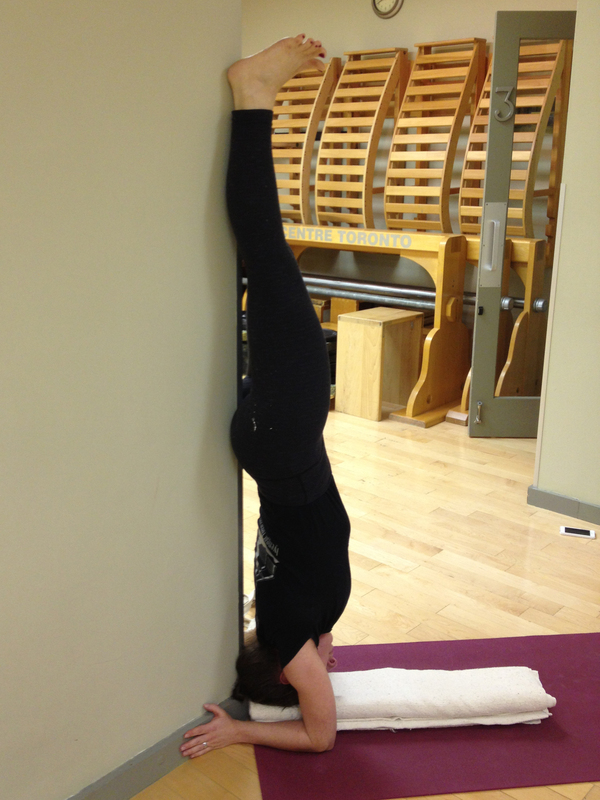 Practicing sirsasana at a corner. By rolling my buttocks up the wall, I’m working to create greater length in the lumbar region of my spine. Yoga is a practice. It’s not a routine or a workout it’s a practice. Practitioners of Yoga, I believe, have a responsibility that goes beyond being guided into and out of the shapes of the asanas. There is a responsibility to personalize the practice, to understand what you are practicing and why. The lessons of Yoga (on so many levels!) go beyond the studio and often, even beyond the mat. Beginner or advanced, a practitioner takes Yoga home with them. When I had just started Yoga, I remember standing at a bus stop and realizing I was actually doing Tadasana. I had become aware of the fact that my tendency was to stand forward on my feet and so at the bus stop, I consciously transferred the weight to my heels and also pressed on the inner foot as much as the outer foot (it all of sudden made sense why the outer heel side of my shoes always wore out first!). I remember thinking, where else could the lessons of Tadasana be applicable? This was a spark for home practice. And in fact, at that time, that was pretty much the extent of my home practice. Home practice does not need to be complicated. It doesn’t matter whether it’s long or short, and it doesn’t need to be the same each time. Most importantly, home practice doesn’t need to be perfect. The truth is, if we did all the poses perfectly why would we need to practice anyway?! In my mind, the most important thing in home practice is to develop a personal relationship with your practice. Why are you practicing today? Is it for endurance? Is it to improve your ability to do a particular asana? Is it because you’d like to feel uplifted, energized, focused, or calm? Do you know which asanas to practice to make you feel uplifted, energized, focused, or calm? Would you like to? Next time you are in class, try this: at the very beginning take a mental snapshot of how you feel. Observe the state of your body, the state of your breath, and the state of your mind. At the end of class, observe these things again. Reflect on which poses you did and the impact that the practice had. I’ve found that over time, training myself to observe such things has deepened my understanding, respect, curiosity and gratitude for this tremendous practice called Yoga. Cultivate & Sustain Your Home Practice! Feeling stale? Has your progress plateaued? Ready to take your Iyengar Yoga practice to the next level? SIGN UP NOW and learn practical strategies that you can draw from to inspire and motivate on the mat. You are all set! Check your email for Lesson #1. Love your blog! In my home practice I “experiment” a lot on what I have seen or read in Yoga Rahashya etc. I will also try out sequences I plan to teach later in the week to see if it has the “effect” I am trying to produce. When I am at a loss, I start my practice with supta pandangusthasana…from there my body tells me what I need to practice. I also love my home practice 💚 . I take my time to adjust an Asana and then FEEL inside the stretching, my internal organs, my breath… it becomes a total meditation and feels soooo good! !